Amazon Japan has started taking international pre-orders for Atelier Rorona: The Alchemist of Arland DX, Atelier Totori: The Adventurer of Arland DX, Atelier Meruru: The Apprentice of Arland DX, and Atelier ~Alchemists of Arland 1-2-3~ DX for Nintendo Switch. 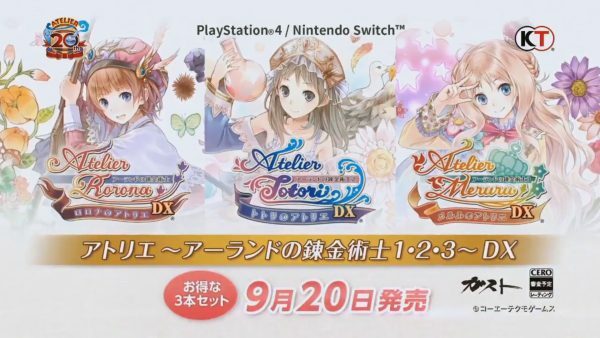 Atelier ~Alchemists of Arland 1-2-3~ DX Premium Box contains Atelier Rorona, Atelier Totori, Atelier Meruru, original soundtrack download, Alchemists of Arland mini-crystal paperweight, and Rorona, Tototri, and Meruru connectic acrylic mini charm set. You can choose to either buy the three games separately or together in the bundle. All of the products launch September 20, 2018 in Japan and ship worldwide.